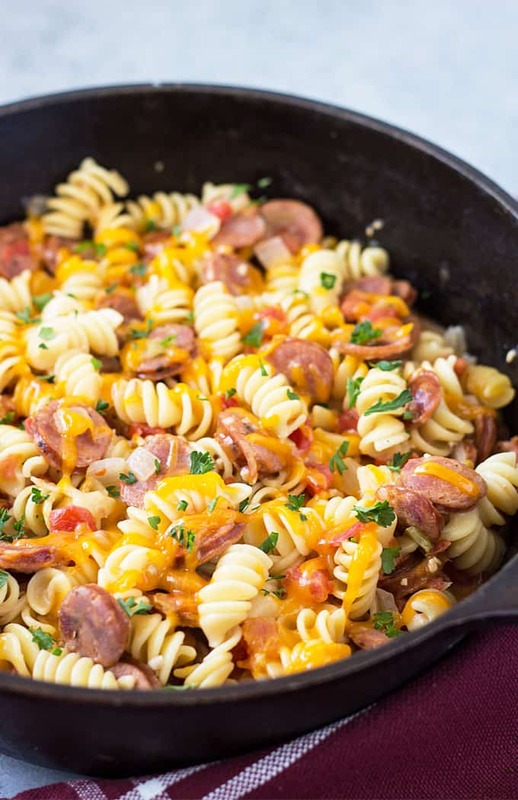 I absolutely LOVE one pot wonders that come together with minimal effort AND minimal cleanup! 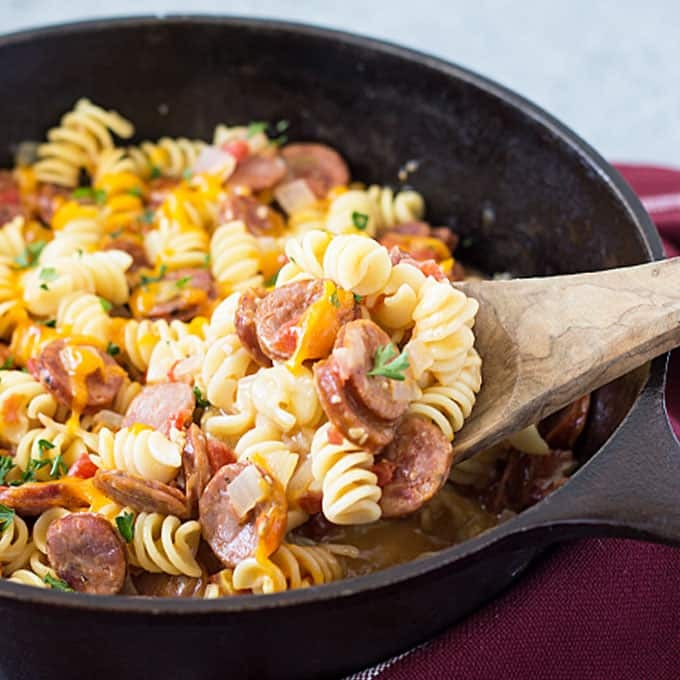 This One Pan Cajun Andouille Sausage and Pasta will be your new go-to dinner in a hurry, and yes… it’s all prepared in ONE PAN. Today’s recipe is sponsored by Aidells® Sausage. 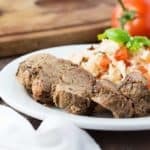 Sign up for my email subscription and never miss a recipe! I understand those hectic days and needing dinner in a hurry. 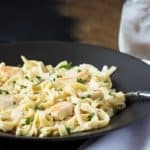 This week has been ONE OF THOSE WEEKS to say the least and I was so excited to have an opportunity to come up with something easy, delicious and with little cleanup. I’ve had some recent issues with migrating the blog over to a new server and have spent several unexpected hours on the phone. To top it all off I’ve been sick and dragging the past couple of days. 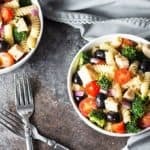 Being sick has never affected my appetite, so this quick, easy and satisfying meal was so much appreciated! I purchased my Aidells® Sausage at Publix. 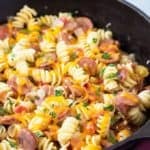 The Cajun Style Andouille Sausage went perfectly with the diced tomatoes and green chiles that I added to the pasta. The pasta cooks right in the pan in chicken broth, heavy cream (or milk) and the juices from the canned diced tomatoes and green chiles. 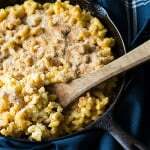 You can use whatever pasta you like; I used rotini because I had it in my cabinet and it needed to be used. This recipe is a little on the spicy side, but not overwhelming at all. 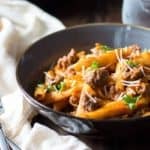 You can reduce the heat by using canned diced tomatoes without chiles (but I loved the extra kick!). 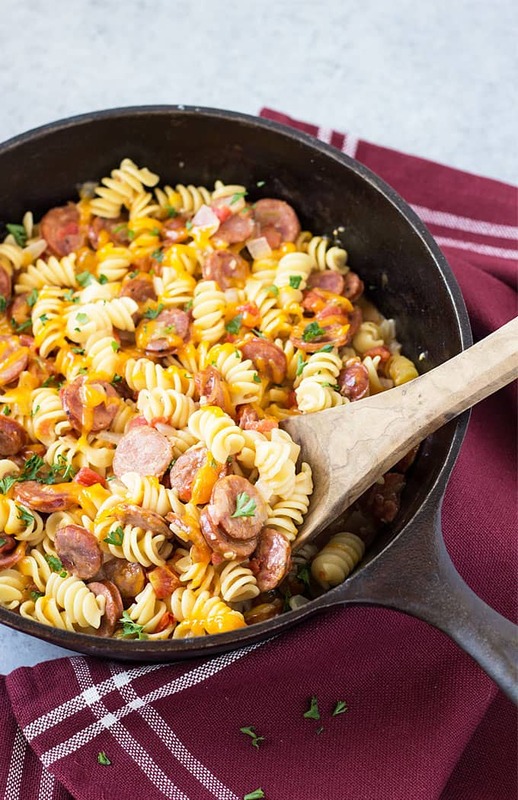 An easy weeknight meal that comes together in ONE PAN and in 30 minutes! In a large skillet over medium high heat, heat olive oil. Add minced garlic, onions and sausage slices. 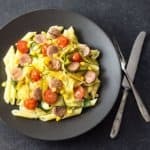 Cook about 3 minutes, or until sausage is lightly browned and onions are tender, stirring frequently. Add chicken broth, diced tomatoes and green chiles in their juices, heavy cream (or milk), pasta, salt and pepper. Stir well to combine. Bring to a boil. Cover and reduce heat to medium-low, or to maintain a gentle simmer. Simmer for approximately 15 minutes, or until pasta is cooked. Remove from heat and stir in 1/2 cup of the shredded cheese. Top with the remaining cheese and fresh chopped parsley.